Many of you have been curious about the update of the project going on at the Liberty School. Bluestone Developers is trying to convert the dilapidated school house into living space of 25 apartment units. Recently I blogged about the façade being fixed with the replacement of the brick exterior. But many would like to know what is going on NOW. I was able to speak to the president of Bluestone Developers, Jerome Blue, about the update on the school. And, he also graciously provided me with the renderings and other images you see here. So what is going on??? First of all, I made it very clear to Mr. Blue that I was not interested in negativity or carrying out a debate with him. He opened up and was very friendly and helpful in providing me information. It was very apparent in my mini interview that this is a very difficult project. Each step involves manysub-steps, and a hiccup in any one of the sub-steps can set the entire project back for months. So has been the case with the development of the school. As of now, all the approvals have been made, such as the zoning boards, the architectural commission etc. However, these approvals do not happen over night and take time. One thing that has set back this project substantially is the parking lot. They had to go through the New York State Department of Environmental Conservation since there used to be a dry cleaners on the site. Tests needs to be run to make sure the site is clean. Approvals have to be made, and consultants are needed for these approvals which equals more money needed to complete this project. Along the way the developers must meet city, state, and federal guidelines. Mr. Blue wouldn’t go into more detail, but overall this is a huge undertaking. Considering all the levels of government the approvals must go through, the money needed, the fine tuning, and hiccups that can happen along the way-this project is going to take some time. Mr. Blue is extremely interested in the history of the structure and the history of Newburgh. 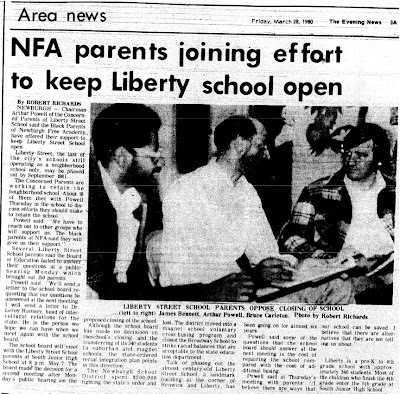 He has even looked up articles on the school’s closing in 1980. There had been talks of closing the school 6 years prior to it’s closing. 550 parents protested against the closing of the school and signed a petition. 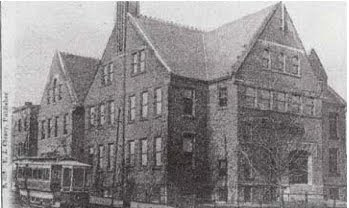 At the time the school closed it had approximately 360 students in grades k-4. Mr. Blue definitely wants to see the project through. That is why even though there is much left to be done in paper work and approvals, he has secured the structure of the building by replacing the bricks. Last time I checked the fence was fixed as well. He mentioned that there is really no point to put up scaffolding if no work can actually be done until months later. It really accomplishes nothing. But rest assured, he is continuing with the project. And, when we last spoke had recently been to meetings regarding the project. So what should you digest out of all of this? It’s going to take time. Whether or not the school will really be developed and inhabited can only be determined with time. But what Mr. Blue would like for people to know is that even though you don’t see anything happening on the exterior, he has not dropped this project. There are still many things going on behind the scenes. Hopefully he will give me updates as things progress. 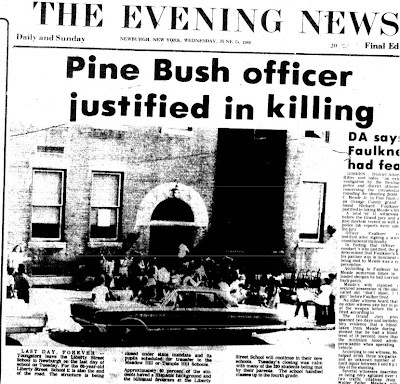 Click below to enlarge the three news articles from The Evening News dated 1980. Thanks for taking the initiative to get a first hand report on the status of this great building. Terrific post. And the Evening News articles are classic. I find this very interesting. I noticed the last time I was in Newburgh that something was going on here, asked around and learned that it was to be condos. I am glad the building will be saved. I attended Liberty St, School from 1951 to sometime in the middle of the schoolyear 1957-58 when they moved the sixth grades to South Junior High. As a … See Morepoint of interest, we started the day at Liberty Street School, gathered up the contents of our desks and carried them with us as we walked to South Junior High where we finished the day in our new classrooms which were located on the top floor at the side and back of the new addition.- Carol Curry W.
I would love to see the school restored to something useful! It’s a majestic building!